When your soft tissue and jawbone become infected it’s known as periodontal disease. There are two stages of gum disease, the first being gingivitis. This is the first stage of gum disease and there’s not much pain associated with gingivitis at first; however, you may begin to notice that your gums bleed when you brush or floss your teeth, or they appear irritated or swollen. The advanced stage of gum disease is called periodontitis. In this stage, the damage caused by gum disease is starting. You may notice that your teeth feel mobile, or that your gums are receding. 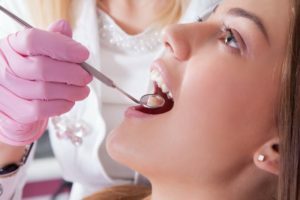 Gum disease that is not managed properly will eventually destroy the soft tissues and bone that support your teeth and will result in tooth loss. Gingivitis can often be successfully managed and even reversed in some cases if it is detected early on. This can be done with a thorough professional cleaning and improvements to your home care routine. A deep cleaning called scaling and root planning that eliminates the bacteria and infection below the gum line. Did you know that many cases of periodontal disease can actually be prevented with regular visits to your dentist for a cleaning and checkup every six months? It’s true! Your dentist will screen you for gum disease at every checkup, and they can detect it much earlier than you can on your own. During your cleaning, your hygienist will remove the plaque buildup that contributes to gum disease. Your hygienist will also have some helpful tips and suggestions on how to make the most of your home care routine. The bacteria that causes periodontal disease has been linked with other health concerns such as cardiovascular disease and diabetes since it can travel through the blood stream and contribute to these issues. This means that consistent dental appointments and a commitment to your home care routine have never been more important. Contact your dentist in Syracuse today to schedule your next cleaning and checkup. Drs. Donald A. Crumb, and Gregory A. Craybas are committed to providing patients in Syracuse, NY with exceptional dental care. They do this by creating a welcoming, patient-centered environment combined with comprehensive services designed to meet every patient’s individual needs. If you would like to contact our dentists, they can be reached by calling 315-475-6641 or through our website.